Whilst the idea of using authentic animal products in perfumery is enough to enrage animal rights activists the world over, there is comfort in knowing that the much sought-after Ambergris (grey amber) is one of a few substances that can be sourced without inflicting any harm to the creature itself. Au contrare... this waxy grey/white material is uncommonly ejected from the intestinal tracts of sperm whales, bringing much relief to the beast in the process. The trouble is, that ambergris is difficult to come by. Occasionally, some very fortunate beachcombers stumble upon lumps of varying sizes in the dunes, and others have scooped the floating material from the open seas with nets - but whatever the method of collection, ambergris will be sure to net you a tidy profit. In recent years, a 15kg lump that was found on a beach in South Australia, has been valued at a whopping $300,000. Its rarity and desirability for use as a basenote and fixative in perfume sees suppliers shell out top-dollar to secure this rare commodity. Its deeply earthy, semi-sweet balsamic aroma intensifies fragrances, and increases longevity. For decades perfumers have been inspired by this rare and precious component, and many have put their own twist on the ambergris theme. 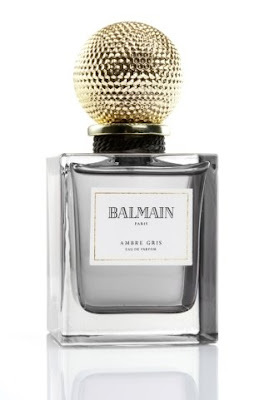 One which I am particularly fond of, is the 2008 Balmain release, aptly named Ambre Gris. Enchantingly presented in a weighty grey glass flacon and twinkling gold crown, Ambre Gris is an opulent elixir that displays characteristics of both a gourmand perfume, and one with a mild animalic edge. It opens with a rousing floral accord that shifts quickly into a candied fruit note... but thankfully one which is not too saccharine in nature. A permeating honeyed warmth seeps through the topnotes, and is followed by a husky iris-like dryness. It is at this point where the scent lingers in an unusual narcotising state of limbo where the balsamic ambergris materialises as if from the murky depths, and is suspended like a shining lure at the end of a fisherman's hook. It is sensuous and smouldering. Wonderful curls of resinous benzoin lend a deep caramel warmth, and myrrh; a soft soapiness to the scent. The edible quality is thick and luxurious like ribbons of golden syrup, but the ambergris at the heart denotes something more organic. Its tranquilizing voice sings through the layers of this perfume like a Siren, beckoning, coercing, ensnaring. Many hours later, Ambre Gris is still evolving. There are fleeting moments of synthetic rubber such as those found in Bvlgari Black, leather much like that present in Acqua di Parma's Colonia Assoluta, and vanilla/musks akin to those in Gaultier2. It is a perfume that has been made for the mainstream market, yet it has all the olfactory indicators that could liken it to many niche releases today. It can be celebrated for its above-average sillage and titanic persistence (8+ hours on me, after 2 discreet spritzes), but more so for its charming take on this prized treasure from the sea. Thanks go to Liz, for sending me with this bottle. A very kind gesture, and much treasured gift. If I've read correctly it's the well seasoned by salt water and sunshine bits that gives the best smelling most valuable ambergris. I bet this was a lot more common when smaller whale boats took to the water and observant shipmates were always on the lookout for these gems on the high seas. Apparently the well-weathered pieces are best... those that have been at sea for a decade or more... bobbing close to the surface... this is apparently when it takes on its extraordinary aroma. Matt, I have only once smelled ambergris in its raw solid form (much like the sample pictured) at a maritime museum in New Zealand, however, never as a tincture or alcoholic extract. My memory of it is as a dark earthy odour, with a semi-sweet quality to it. It was mildly repugnant too. Very tricky to describe actually. I would be delighted to revisit it. I had hoped ambergris would have been included in an essence kit I am due to receive via my perfumery course (a kit with 88 extracts), but alas, no. I will shoot you an email shortly. Thanks for making me aware of this new beauty. I just received it today. I've had it on for about 15 minutes and it really is following your descriptions. You mentioned a kit for your perfumery course. What course are you taking? Ooops, sorry, should have scrolled further down the page. Just saw your posting about NNAPA. Congrats!